If you have been reading this blog, you know that we have had issues with our rib scores over the years. Our baseline experiment to improve those scores was to cook for six hours, without any foil, to see how tender the meat on the bone was. I was close, but not 100% there. 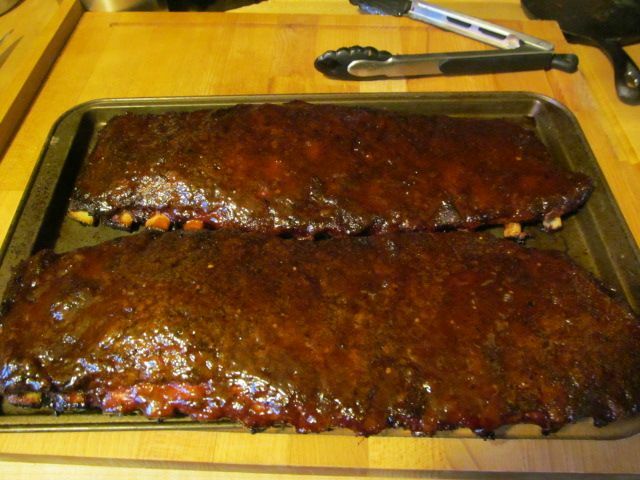 So for this cook, I cooked ribs, unfoiled, for seven hours at a lower heat of 225 F to see how they turned out. Here is what we found. 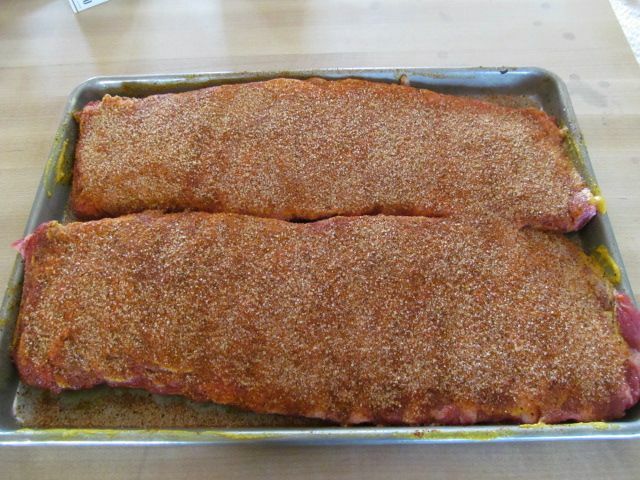 First, we took some St. Louis spares, rubbed both sides with mustard, and sprinkled our rub/sugar mix liberally on both sides of the rack. 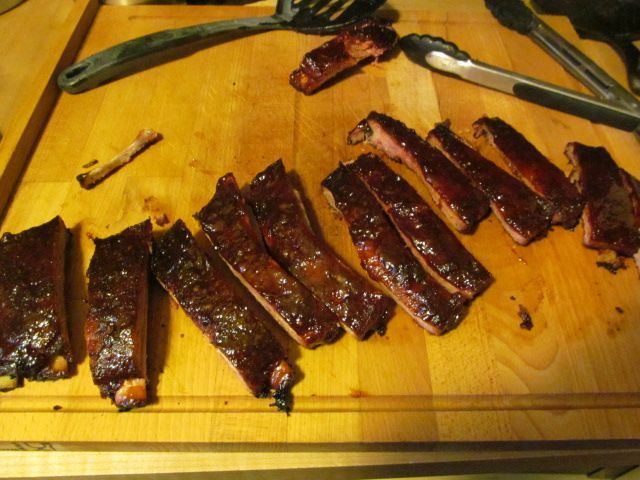 Then, I let them come to room temperature on the counter while I brought the smoker to a temperature of 225 F.
Once the smoker reached 225 F, I placed both racks on the top shelf in the middle. For smoke flavor, I placed a mixture of apple, hickory, and pecan into the ash pan. Then I shut the door and walked away. After three hours or so, I rotated the racks left to right for even cooking. Does it really help? Who knows, but it makes me feel useful during the down time. At the six hour mark, I brushed on a thin layer of my BBQ sauce. Then, after 30 minutes, I touched up my sauce with another thin application. 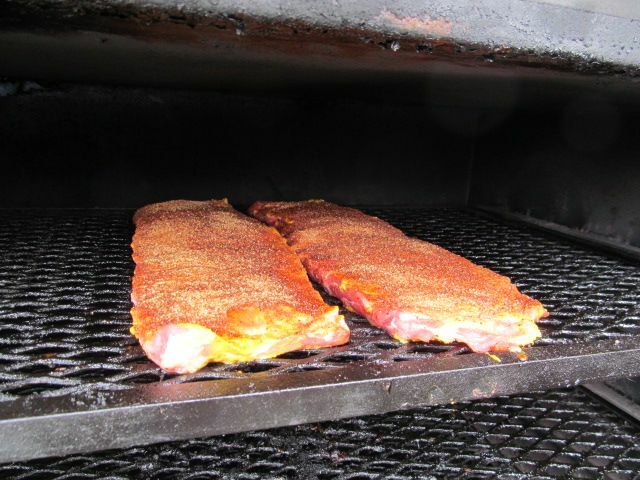 At the seven hour mark I brought the racks inside to rest for 15 minutes before slicing. Look at that shiny glaze? Almost too beautiful to slice. Well, taste is a component, so we sliced and dug in to try. As you can see, more often than not I seem to get my ribs from pigs with bad posture or curvature of the spine. Very bad for a turn in box. As for the tenderness, I would say that after seven hours, these bones were just a bit over done. They were right on the line of being fall off the bone. So, I would have to say that after six and a half hours at 225 F on a smoker, you will produce a rib that is acceptable to a KCBS judge for tenderness. Stay tuned for another method that just might be better. It sure is fun practicing. That does sound like a very long time for cooking. I do not know the answer for the perfect cook but I have observed shorter cooking times. Nicely executed, Bill. 6.5 hours at 225 with no foil seems kind of long, but what do I know, they look awesome and good is good after all. That is the art of BBQ. Impressive. Every time I venture away from the foil, bad things happen. You give me hope! On another note, I've finally had occasion to poke about your site here, and have been enjoying it immensely. You have some great stuff going on that any pit keeper would relish. You've been at this for while, I deduce, and it shows. Very cool. I wish you success in your up and coming competitions. I never foil when it is just for home eating PotP. But, you have to when you compete. I have not succumbed to the blue bottle squeeze butter. That is just plain un-American! Thanks for the complement. You site is quite nice as well with great stories and writing. This will be our third full season. Fortunately (or unfortunately, your choice) we won a trophy our first time out and my wife fell in love with competition BBQ. We have not looked back since.